You can now access the eSchoolPlus Home Access Center from your electronic devices by downloading the eSchoolPLUS Family App! * For iPad, iPod Touch and iPhone--use the App Store. * For Android devices--use Google Play Store app. * For Kindle Fire--use Amazon App Store. This app will allow parents and students to log into their accounts. Please note, student photos are available, but are only visible if parents/guardians have access to more than one student. To download the User Guide, please click on the link below! 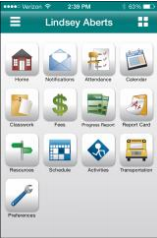 PLEASE NOTE: If you download the latest Apple iOS Version 9 update, the eSchoolPlus Home Access Center Mobile App for iOS will no longer run. The eSchoolPlus Home Access Center website continues to be accessible from a web browser. eSchoolPlus is aware of this issue and is actively working to update the mobile app.